It may have kicked off with one groundbreaking product – the original Dreambox – but the idea of building a digital set-top box around Linux is now a widely-accepted practice. Thanks to its open-source ideals, others can refine the firmware or indeed develop their own from the ground up – a worldwide community of people can develop for the box. One of the latest Linux-based satellite receivers is the Vu+ DUO which, despite its relatively modest asking price, is aimed at the upper end of the market. Features include two DVB-S/S2 tuners, the ability to add a SATA hard drive for PVR use, HD capability and a host of network-related functions. 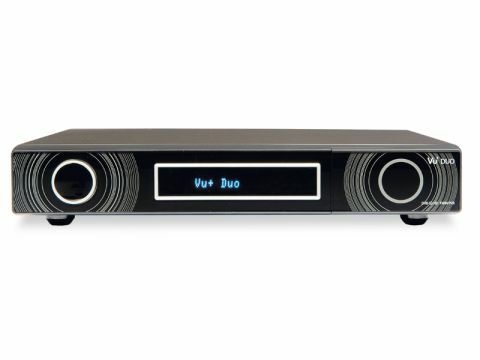 The uncluttered fascia of the Vu+ DUO is distinctive. Adjacent to a very readable 16-character fluorescent display is the 'dialswitch', a rotating wheel used to sequence through lists – pressing it selects the highlighted item. Waking up the receiver in the first place could be a problem; there's no standby button, and so the remote is essential. Fortunately, when power is applied the receiver goes into its switched-on state as opposed to standby. To the right of the display is a flap that conceals a USB port, two card-readers and two CI slots. With the 'stock' firmware – Enigma2, which will be familiar to users of the Dreambox and other Linux receivers – the Conax and Xcrypt CAMs are emulated. The Vu+ DUO boasts two LNB inputs, one for each tuner. There are no loopthrough outputs, but a menu option internally feeds the input of the second tuner with the output of the first. Although this means no clumsy patch cords, you won't be able to feed a second receiver. Scarts are provided for TV and VCR. There are also component and HDMI (up to 1080i) outputs. Also on the rear panel are an optical digital output (audio is also conveyed via HDMI), an eSATA port, two USB ports, Ethernet and a 'legacy' RS232 interface. The high-speed data ports allow firmware to be upgraded, and storage devices attached. It came pre-installed with the Enigma2 firmware, but there are several alternatives knocking around the internet, including Open PLi, Dream-Elite and VTi – each with their own benefits, such as UK-specific EPGs, support for USB DTT tuners and internet video players. But for this review we'll stick with Enigma2 because it provides most of the day-to-day essentials. In the interests of neatness and economy we recommend an internally fitting SATA HDD. While installing the drive, we appreciated the neat construction. Unusually, the tuners are not the usual 'bought-in' screened cans – they're constructed on the main circuit board, which also sports components like the memory, interfaces and the heatsinked (Broadcom) core chip. Peripheral boards contain the switch-mode power supply and smart card readers. Switch on for the first time and a series of 'wizards' help you install language, tuner setup, parental-control options and an initial scan – all parameters that can be modified later on via the comprehensive setup menus (among which is the HDD-formatting option – you'll need to use this before recording). The DiSEqC capabilities are good. In addition to 1.2, the Vu+ DUO caters for simple switchboxes (1.0) and USALS. All the usual controls for dish movement are supported. Searching can take place on single or multiple transponders – multiple satellite searches are also allowed. Here, you just select the satellites from a list and the receiver 'visits' each in turn, moving the dish where necessary. Manual searching gives you the usual control over frequency, polarity, symbol rate, FEC and modulation (DVB-S or S2) – PID entry is not permitted – with this firmware at any rate. You can search for all channels or just encrypted ones; network scans are also permitted. There's no blind search, although Lavatronics told us that may come. Other menus look after AV setup, networking, USB keyboards, GUI styles ('skins'), storage/recording, timezones, language and so on. The channel-change buttons bring up the current satellite's channel list. Pressing the green button lists the available satellites, the contents of which can be viewed by 'service' (all channels), 'provider' (sorted by network) or 'new' (channels found since the last scan). There's also a 'master list' of all channels. A welcome handset feature is a pair of keys that jump to the first and last entries; another nice touch is that if the relevant EPG data is in the machine the name of the show currently being broadcast by the channel is shown. In channel list mode the blue button switches the channel list to favourites mode. The default list has a German bias but it's easy to replace the channels with ones more to your liking. Pressing the menu button lists the relevant options. When you change channel an 'infobar' giving the channel name and the current/next programme among other details is displayed – this can be called up any time with the enter key. A menu-selected info screen displays the technical details of the current channel. Dedicated handset buttons make it easy to enable subtitles, view teletext services, choose from the available soundtracks, switch between radio and TV modes and enable the EPG. This supports both now-and-next and seven-day schedules and takes the form of a text list. There are two modes – single channel, which lists up to 13 consecutive programmes, and multi-channel. In the latter up to 11 channels can be shown simultanously. Use the yellow and blue keys to jump to and fro through the schedules. The timer can be programmed from the EPG or manually invoked by pressing the red button – you're asked whether the recording should end with the current programme, after a user-defined period (equivalent to a VCR's OTR facility) or whether it should continue indefinitely. As it's a twin-tuner unit much recording flexibility is offered. If you're using a dual-LNB you can record programmes on two different channels regardless of transponder. Simultaneous viewing of a third channel (provided it's on one of these two transponders) or an existing recording/multimedia file is also allowed. Lavatronics told us that with alternative firmware as many as six simultaneous recordings of different channels is possible. Timeshifting is also supported. A wonderful feature of the Enigma/Linux approach is the ability to download free plug-ins, which add functionality. There are currently more than 70 of these, ranging from an image-viewer though onscreen e-mail to a web interface. The latter is particularly recommended; after the hassle-free installation process type the receiver's address into a browser and take control of the receiver with the webpage that appears! Channels can be selected from here – you can also invoke recording, access EPG info and schedule timer events. It's also possible to stream or download recordings (which are in transport-stream format) to a PC. An alternative to the web interface here is FTP – the necessary server is built into the firmware. You can access the Vu+ DUO via the network when it's in standby – this is because much of the receiver is still active. However, there's also a deep standby mode that consumes little power, but it's incompatible with timed recordings. Not only can you log into the receiver to back-up one or more recordings to your PC via FTP, but files can also fly in the opposite direction. Useful if you want to use the Vu+ DUO as an FTP server (with appropriate network setup, this – like the web interface – could be accessed via the internet). You could also transfer multimedia files to the box; the onboard 'media player', which is also used to play recordings, is compatible with a variety of content. Standard/hi-def MPEG, DivX/XviD and MKV video clips are compatible, as are MP3 music tracks. Unfortunately, WAV files (uncompressed audio) locked up the player. In addition, images are ignored. If you want to view photos on your TV you'll need to download and install the aforementioned image viewer. Sound quality and picture quality are both excellent, especially if HDMI is employed. Sensitivity seems to be good – all mainstream European channels are received reliably with a 1m dish and 0.7 dual LNB despite some traditional British summer weather. Like many Linux receivers, the Vu+ DUO can take a long time to start up from cold – waking up from the regular standby mode, in contrast, is almost instantaneous. Searching speeds can be slow. A full search of the Astra 1x cluster was completed in just over six minutes, while a Hot Bird FTA scan took nearly 11 minutes. The user interface and menu system are, on the whole, pleasantly responsive. Reliability is good, all timed recordings completing without a hitch – we only had the 'green screen of death' once during the setup phase. Our only real trouble concerned DiSEqC, certainly with a Moteck positioner. Although there was no problem configuring satellites during the setup phase, the dish would fail to move when a channel on a different satellite was subsequently selected for viewing. There are plenty of DiSEqC parameters in the setup menus and a tweak of these restored normal operation. If you run into problems you'll appreciate the wide range of support the Vu+ DUO enjoys on internet forums. Overall, though, this receiver impresses and – with the exception of blind search and PID entry – has everything you could ask for at a sensible price.